The fanfare for 3D printers has ebbed and flowed over the years, but never quite breaking into the mainstream. A lot of this has to do with no true, flexible 3D printer product. 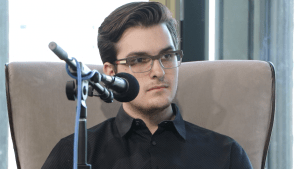 Ethan Baehrend, an 18-year-old entrepreneur and CEO of Creative 3D Technologies, points to a stagnant 3D printing market that doesn’t have incentives for competition or to fill a space when they are comfortable in their own niche. This frustration led Baehrend to start building his own 3D printing manufacturing company and a new printer, the CreativeBotDuo, that can handle a spectrum of objects from small to large for personal use. With the creation of one of the industry’s first all-inclusive printers, one of the biggest barriers to consumer entry is “maker” education. Host Scott Kitun went back and forth with Baehrend about the problems with high school ed, the struggles to implement true STEM education and the lack of woodshop and carpentry classes with no modern day replacement (there are no 3D printing classes widely available). Baehrend, still a senior in high school, pointed to his own self-education that was the most obvious method available. He started with printing small gifts for family, then building computers, then refurbishing 3D printers, taking online courses and teaching himself to code along the way. With the support of his parents, Baehrend feels he effectively “homebrewed” his college education. Listen to the podcast to hear the full conversation between Scott and Ethan on all things 3D printing, the maker space and beyond, sponsored by Bank of America and MB Real Estate.